We had a lovely week in Crete end of October - the villa was larger than the photos lead us to believe with quality furnishing and appliances throughout. The rooms are a very good size, the kitchen is well equipped, the bathrooms are great, too. Excellent WiFi connections helped to keep our teenagers entertained whilst in the villa. Due to the slightly cooler weather end of October we didn't use the pool more than once and left the BBQ area untouched - but I can imagine it to be lovely during the hotter summer months. Antonis, the owner, was extremely helpful throughout and answered all possible questions promptly. We arrived to find enough food and supplies to last the first few days - something we have not always experiences during other villa holidays and we really appreciated this. Antonis made us feel very welcome and even helped us to order some pizzas for the first night. The area around the villa is nice, too, and it was very easy to reach beaches, towns and other sights by rental car. Overall: a quality property with a very helpful owner. Would def. like to return one day. The house is fantastic! This year we had several friends over from Holland and Crete. Everybody was blown away by the architecture, the furniture, the equipment, the comfort, the view, etc. etc. Owner Antonis Vergetakis is a very friendly person and takes care of everything! We're already planning to go next year! We tried to book the villa next door but this was not available and were offered this one instead, (lucky for us). Our flights meant we were arriving a day early but this was no problem to Antonis, he arranged at his expense to put us up in an apartment close by for the night, he personally collected us the next day and took us to the villa. As you drive through the gates you get the WOW factor this continues as he takes you inside and shows you around, you are given a welcome pack that has been carefully thought out this contains all you need for several days including some excellent wine, a great surprise and very much appreciated. The rest of the villa is stunning in its size and quality with all electrical appliances being of the highest quality and there are gadgets galore to keep you amused The photographs on the web site do not do the villa justice. Antonis is very helpful and nothing is too much trouble for him, any problems are resolved straight away and his recommendations for restaurants are excellent. We had a perfect stay and would rebook this villa without hesitation again. Just returned from a weeks fabulous stay in Villa Theano. We were a family party of eight adults, one child and a baby who all had a fantastic time there. The villas website pictures really does it no justice. When we arrived there was no cot or camp bed as requested by ourselves. The owner, although just married the previous day came asap and sorted the problem with no fuss and full of apologies. There are wonderful views from the house , the pool is excellent, and the bar-be-que area is superb. Although the house decor is a little outdated there is plenty of room with everything that you need and has many good quality appliances. Nice touches are the fluffy bath robes, safes in all rooms and the outstanding welcoming pack which was very much appreciated.The village is not far from the main town of agois Nicolaos where there are many lovely restaurants, cabs cost €8 to town. Would definitely recommend this Villa. We all agreed we would love to go back there. We had a fantastic holiday at Villa Theano. It started with all the help and advice Antonis the owner gave us before we arrived, he booked car hire for us and answered lots of questions about taxis etc. When we arrived in the evening I opened the door first and turned to the others and said wow you have to see this. The open lounge dining and kitchen area is far more spacious and luxurious than we expected the photos really do not do the place justice. We were also greeted with the most generous welcome pack we had seen and Antonis soon turned up and seeing it was quite late evening offered to get takeaways sent to the villa for us. Next day Antonis came round and spent time not only showing us how everything works at the villa but gave us numbers for taxis and a good list of recommended restaurants and places to visit. Subsequently we did not see much of him but he was always there to help at any point. A couple of the party wanted to stay in one evening and Antonis gave us numbers for places that will deliver food from the centre of town. After we had ordered he rang the restaurant to check they understood the order and where the villa was. Nothing was too much trouble. I suggest you follow his restaurant advice (see my reviews) we only went to one of the more obviously touristy places (that had great reviews on TripAdvisor) once and regretted it. Pool was deep and bigger than normal but with steps you can sit on. Nice lush grass surrounding lots of sun loungers electric canopy over the verandah and it is all lit beautifully at night. Make sure you have a barbecue at least one night and make sure you find the ceiling lights with the dimmer in the bbq area. Antonins also pointed out the local supermarket best place for local veg/fruit as well as a meat market. Choice is more limited than we are used to in the UK but we got everything we need. Taxis just €8 to the centre of town, you can phone they know the villa and they come in 10mins. Restaurants will call taxis or there are always some waiting at the taxi rank in the centre of town. We had an excellent trip scuba diving (Pelagos) as well as to Watercity, Knossos (we did it quick with a guide book but no guide as it was very hot), Lassithi Plateau, Elounda and along the coast to the east of Ag Nik. VIlla had everything we needed I am sure Antonis will answer any questions you have. The boys even had a spa bath once or twice. Air con is powerful and gets the rooms nice and cool. The top room is cute but quite small and requires climbing a second quite steep staircase - not easy with cases. My wife wished she had brought her own hairdryer as the built in one's are quite weak. Then again that was an excuse for an extra glass of wine on the terrace while her hair dried. But really the place was fantastic far nicer than the photos show - the best villa we have stayed in and thanks Antonis for all your help and friendship. Perfect Villa, calm & peaceful area, safe, clean, beautiful view, very good swimming pool, very nice barbecue area, large living-dining room & kitchen, full household equipment, excellent wi-fi... We are family of 5 (3 children) and we stayed 3 weeks in July. The Villa has everything we needed. There are several very popular beaches 5 minutes by car ! This is big advantage, since this is not so common for Crete. Usually people need to drive an hour everyday to the nearest nice beach -> Crete is huge and it is more like continent then an island :) Antonis (the owner) support was on high level, so you will feel at home, away from home! Lovely high quality villa with views out to the bay in the distance. The owner Antonis could not have been more helpful, nothing was to much trouble. Close to the Carrefour supermarket and easy driving into Agios or Elounda. My only reason for giving 4 stars and not 5 was nothing to do with the villa, we just would have preferred a villa closer to the beach or the town so we could walk more rather than always use the car. We loved the house. It has everything you need for a great holiday. The kitchen materials and utensils were of very good quality. the living room was cosy and spacious. all technical devices were functioning very well. all four bedroom were great with good beds. the bathrooms were spacious. the whirlpool was just great to relax as well as the rain shower in the other bathroom which has massage functions. The pool is large, pure and deep - good for a swim. The house is children friendly, we came with two small kids (5 and 3): no sharp endings or steep stairs. We only had to watch out for the kids at the poolside since the water is 2,20m deep. The beautiful town of Agios is only 5min with a car and has nice beaches, lots of cafes and restaurants and a nice shopping area where we all bought vacation hats :). The location of the house is perfect as a starting point for excursions: We took daytrips to the zeus cave, Elounda, Ierapetra and some southern sides, Vai, Knossos and places in between. The Heraklion airport is only a 50min drive from the house. Also, Antonis was extremely helpful. Not only did he pick us up to guide us to the house (it was already dark when we landed) but he also ordered food for us in the first night, fixed minor things in the house (wifi broke down for 2h and he immediately fixed it) and gave us tipps for beaches, restaurants and excursions. It would be good to store some beach toys for families with kids so that new guests do not always have to buy the same things. Since the moment I showed interest in renting the Villa, Antonis was very helpful in providing me with useful information about the location and the villa, which gave me a sence of trust. The villa itself is excellent, all the amenities make your stay very pleasent. The pool and the BBQ are are great to enjoy a meal outside. Antonin was even more helpful while at the in providing us with information about where to go, eat, beaches, etc. Very, very, very please with everything, highly recommend and can't wait to go back again. Villa Theano is a fantastic place to go on vacations, it has everything you need to enjoy the Crete experience. The view of the Aegean Sea from the terrace is just breathtaking. We were a big group of people and all of us share the same opinion about the Villa. The hospitality of the owner made our late night arrival enjoyable. Wine, snacks and even milk for the children were waiting for us, so we could start relaxing as soon as we arrived at the Villa. If you are planning to visit Crete, I recommend Villa Theano as your destination. Much care & attention has been given in the design of this establishment with quality fixtures & fittings throughout. Could not fault it in any way, well managed under the control of Antonis who was available for any assistance or advice. Would not hesitate to recommend this Villa to anyone. We rented the villa for one week from Antonis, the owner. We cannot tell too much, as absolutely everything was to our full satisfaction. Antonis is acting highly professional and has great experience in tourism and dealing with clients. In the villa your will find everything you need, if there should be anything you still miss, be sure, Antonis will organize it! All equipment in the villa is high quality, e.g. kitchen tools by Miele, water pipes from Grohe, floors made of teak wood etc. The water in the pool is crystal clear and all things are maintained very well. So if you intend to spend a friction free holiday stay close to Agios Nikolaos, rent this villa. The view to the sea is much better than shown in the pictures, as they used a wide angle lens ... Driving time to Agios Nikolaos is 5-7 minutes, a big LIDL store is also only about 7 minutes away. Antonis recommends a lot of things (if you ask for), like best beaches and restaurants in Agios or Elounda. You can trust him, they are really good, especially the 'Ferryman' in Elounda! There is plenty of room for 6-8 people, we have been just the two of us which gave a the total luxury in a holiwood like villa. For sleeping we finally choose the top room, small as under the rooftop, but with an own bathroom plus toilet and a great 180� view to East South East, including the sunrise. I was here with my wife and mother in law for 12 nights and we had the best of time! The villa is well equipped and is even more beautifull then on the pictures. The caretaker Antonis Vergetakis is very friendly and helpfull. Everything we agreed was taken care of. Also the cleeningladies are very friendly and most accurate. We're planning to visit this beautifull place again! Nous sommes restés une semaine 6 adultes et 2 petits enfants 3 ans et 10 mois. Très chouette maison bel espace pratique avec des enfants. Nous gardons tous un bon souvenir de notre séjour en crte. Les propriétaires sont très sympas et très disponible. We stayed here for a week & this villa is AMAZING, the pictures do not do this place justice. We arrived to a fridge stocked with a few bits of food and some wine, this was so lovely and having a glass of wine on arrival, taking in the stunning views was brilliant. The pool & BBQ area's are great. We managed to get plenty of food from the Carrefour. If you don't hire a car, a taxi is about �8 to Agios Nickolaos. A car is not essential. We would definitely recommend staying here. A week in heaven! We had the best summerholiday ever. The owner gave us great tips and we could not be more greatful. You need I car, because it is 5 min drive to the nearest beach and Agios Nikolaos. The villa is really spacious it has four bedrooms, three bathrooms, spacious living room and fully equipped kitchen. In the refrigerator we found enough food simply the first aid after our arrival. Area is very quite, relaxing. We liked gorgeous viewes. Tavernas and shops like grocery are few minutes drive from the villa. Antonis is the perfect host always there to help us with a smile and making us feel at home. We often spent our days swimming and sunbathing and feeling in perfect contact with nature. The pictures do not do the villa justice! We arrived at sunset and it was so beautiful thing! My husband and I thoroughly enjoyed our stay and will recommend this hotel to many more in the future. Thank you again for making our vacation magical. This was the first villa we have ever booked in Greece, so I was a bit nervous not knowing what to expect BUT I have to say that from step 1 - contacting the owner, booking the villa, renting a car, directions to the villa, our stay and right up to checkout was a breeze. This was entirely due to the owner of the villa - Antonis - who arranged everything for us!! The villa, kitchen and bedding was spotlessly clean and fresh, all top-grade appliances worked perfectly, the pool was gorgeous and the location couldn't be better..a short drive to Agios Nikolaos, Elounda, Golden Beach, and other attractions. For groceries (Carrefour, local butchers, bakeries) were all nearby. However, it was so comfy at this peaceful villa that we spent days lolling around by the pool & garden with its stunning views of the sea and olive groves. The only blip was the wifi router which would go down on occasion but Antonis would fix almost immediately. The other caution is that the pool is deep. We knew this prior to booking but our kids (7 & 10 years) are exceptionally good swimmers, so it wasn't a big issue for us. We were in that pool day and night! Great property with beautiful views over the bay. Car essential, local resorts 5-10 mins drive. Stayed with husband and 3 teenage children. We had plenty of space and the kids loved the pool. Owner very friendly and always available if any assistance needed. Welcome pack on arrival which was unexpected and gratefully received. Only thing to mention is that although each room has a dvd player, there is no library of dvds so you need to remember to pack your own. An amazing holiday! The villa is equipped with everything needed for a perfect vacation! The villa is very clean, well maintained and built excellent to accommodate a large family or couples with children! Excellent location, quiet street with breathtaking views of the bay. Authentic Greek area but within a reach of all entertainment sites, restaurants, shops and pubs of the city. Antonis greeted us with a worm smile, answered our questions and solved every problem that came. We will certainty come back to VILLA THEANO in our next vacation! Highly recommended! We had a wonderful 2 weeks at Villa Theano. The villa was well furnished and equipped and in a great location - in its own quiet grounds but only a few minutes drive from Agios Nicolaos. On arrival, the fridge was stocked with everything we could possibly need. Antonis, the owner, visited on our second day to ensure that we had everything we needed and to recommend some excellent local restaurants. He then left us in peace but with his mobile number for any domestic emergencies. The pool area at this villa is magnificent - large clean pool, large terrace areas with lots of high quality outdoor furniture and a hammock strung between 2 palm trees! What more could you want? My family and I stayed at Villa Theano at the beginning of June and had a wonderful stay. Antonis had filled the fridge up for when we arrived which was great and he was always on hand if we needed him. The villa comfortably sleeps 8 people. The BBQ area is amazing and my children who are 9 and 7 loved playing in the pool and around the garden area but they most enjoyed visiting the vegetable patch at the back of the villa with Antonis's father.The weather was great all week which is always nice and we enjoyed going into centre of Agios Nikolaos where we enjoyed some great meals but always enjoyed coming back to the villa. 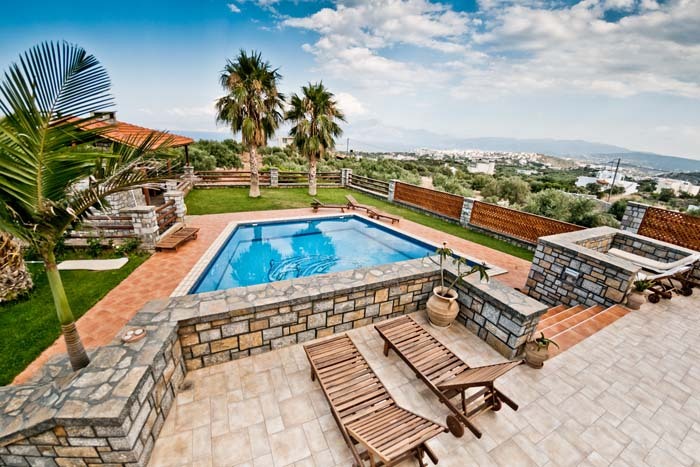 I would definately recommend Villa Theano to anyone looking for a luxurious, relaxing stay in Greece and is ideal for families looking to go on their own or with another family. Our stay at the Villa Theano was extremely enjoyable as a result of the quality of the villa and its fittings and the generosity of the owner in providing a fridge full of food and drink on our arrival at no extra cost. We could not fault the quality of service provided by Mr Vergetakis, and can thoroughly recommend the villa to others. Villa Theano was an excellent choice for our stay in Agios Nikolaos Crete. It has wonderful facilities, incredibly lovely sea views and is of a very high quality. We especially enjoyed the lovely outside patio area, large swimming pool and "lapa" barbeque area where we had the most wonderful Cretan fish "braai". The owner immediately responded to any enquiry we had and we always felt well looked after. I would suggest hiring a car since the nearest supermarket is driving distance and that also enables you to go and explore all the lovely little shops in Agios Nikolaos. I would highly recommend this villa as it is truely a luxury stay. We had a wonderful time there!! Beautiful villa, spacious, modern, very clean with all mod cons. Very luxurious with fantastic veiws. The pool was great and the veiws over the bay of mirabella were wonderful. The owner was very helpful but did not bother us unnecessarily and we felt at home. A wonderful holiday in a spectacular location. Our family and friends, a group of 8, stayed at Villa Theano in July 2011. The Villa was perfect, extremely comfortable, spacious and well equipped with spectacular views over the sea and town of Agios Nikolaos. Villa Theano is located approximately 3km from the town centre and is walkable if needed, although there is a good taxis service recommended by the villa owner. The villa owners couldn't do enough for us, organising taxis, recommending places to visit and eat and even providing fresh vegetables from the villa gardens. The villa was cleaned twice a week to a very high standard, providing fresh bedding and towels. Agios Nikolaos was a lovely place, great beaches, restaurants, bars and shops. We would highly recommend Villa Theano, we had a wonderful holiday there and would happily recommend it to anyone. The BBQ, Pizza Oven and outside dining area were particularly impressive. We were 2 families, in total 9 adults. Stayed in the Theano villa for 3 nights. The Villa is High standard equipped and Excellent maintained. The welcome package was much more then standard including many surprises. Yannis and his son Antonis are running the place. Both are very gentle. Yannis took us for a quick "guided tour" to see all needed places such as supermarket, butcher etc. Antonis gave us a lot of useful information on restaurants and places of interest in the area. We passed wonderful time and I am quite sure that we will come again for longer time. I have just returned from a week long stay at Villa Theano with friends and am extremely happy with our stay. The Villa is plush, clean, fully equipped, and with stunning views. It is often the way that a Villa or accommodation looks worse in real life than it does in the pictures, but i am actually very surprised to say that with Villa Theano, it is the complete opposite. The condition of the rooms and outside areas exceeds how it looks in the pictures. For example, all rooms have beautiful tall apex-ed ceilings with exposed wooden beam joists which gives such an expansive feel to the rooms (i like architecture :)). For some people this is a stunning feature, but this goes ignored in the advertised pictures as there is too much goodness to show :) All rooms are air-conditioned, with televisions, safes (handy), towels, bathrobes. The kitchen is stocked with all the utensils you could need, a great coffee machine, ice maker, living room has a huge TV with a fantastic sound system adjacent to the outside, should you want to hear music by the pool too. BBQ is fantastic, as well as a clay oven! The views are breath taking, i could go on and on and on, you honestly would want for nothing at this place, we were even asked what extras would we want that weren't included and struggled to think of even frivolous things, as the main one we wanted was wifi internet, which is of course included. In fact, all we could think of was inflatable lilos to relax on in the pool, but we have since purchased these and left them for future visitors to enjoy! (They are neatly stored way out of view in the many storage cupboards downstairs, should you not be interested in these kinds of things) For the money it is fantastic value. Downstairs the open plan makes you feel free, and upstairs the rooms are private enough for you to get your quality alone time. This is a legitimate review and not done by any family friend of the owners! lol. I was just so impressed by the service, and also the fact that he is shipping me some things that i forgot in the Villa that leaving an absolutely glowing review is the least I could do. If you want to see if this is a legitimate review, or would like an outsiders view or have any questions about the Villa, feel free to email me at akkaravias@googlemail.com and i would be happy to oblige for my good friend Andonis at Villa Theano. If you are considering this, don't hesitate. Book now, you will not be disappointed.